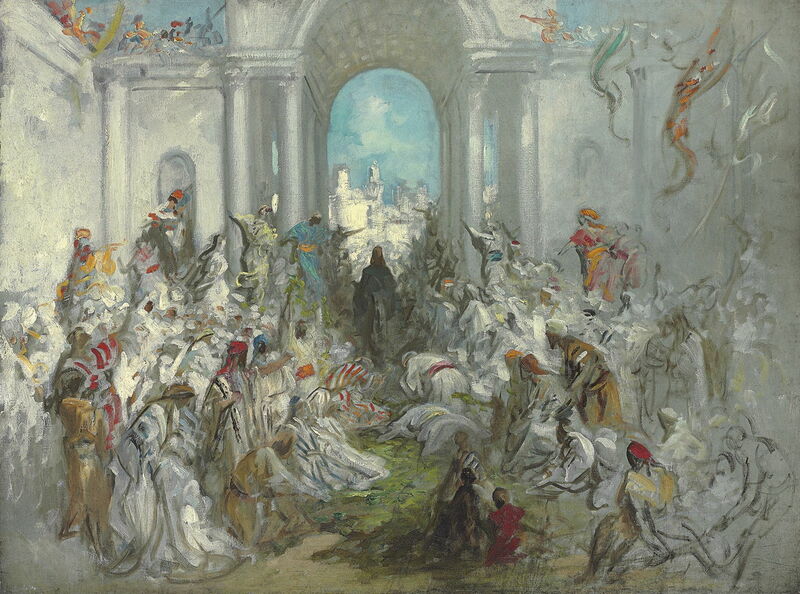 Gustave Doré (1832–1883), Christ's Entry into Jerusalem (before 1876), oil on canvas, 98.4 x 131.4 cm, Private collection. Wikimedia Commons. Gustave Doré (1832–1883) is today known almost exclusively as a print-maker and illustrator of many books, although you may stumble across an occasional watercolour landscape or huge canvas of his, and he was a sculptor too. Some of his landscapes are outstanding, but produced during the era of Impressionism have been cast aside by history. I here consider some of his narrative oil paintings, for if anyone understood narrative art, it should surely be such a prolific and successful illustrator. Doré was precocious child, and started his career as a caricaturist for a newspaper at the age of 15. By the 1850s his illustrations were being commissioned by major publishers in both France and Britain, including a new illustrated English Bible. Here are two prints from that work, which was published in 1866. 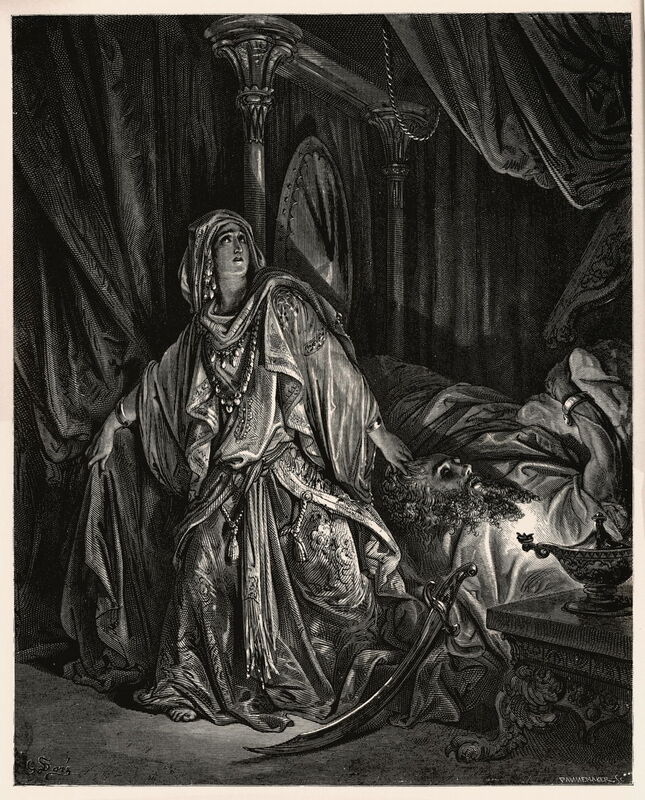 Gustave Doré (1832–1883), Judith and Holofernes (1866), print from illustrated edition of the Bible. The first shows the popular story of Judith and Holofernes; Doré avoids the most powerful scene of the decapitation itself, but follows the more guarded approach adopted by Etty and others, as would be more acceptable to a Victorian publisher. 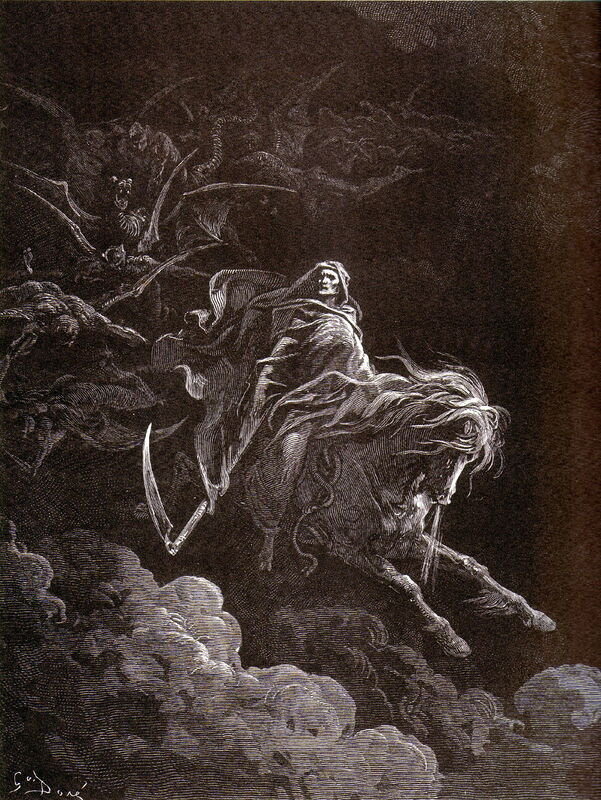 Gustave Doré (1832–1883), Death on the Pale Horse (1865), print from illustrated edition of the Bible. His Death on the Pale Horse, to accompany the book of Revelation 6:8, remains one of the most popular (perhaps truly iconic) portraits of the ‘Grim Reaper’, whose visits to families were all too frequent at the time. Doré first illustrated Dante Alighieri’s Divine Comedy as early as 1857, but returned to it in the mid 1860s. He painted several works derived from the first part, Dante’s Inferno (Hell). This describes Dante becoming lost in a wood and unable to find the way to salvation. He is rescued by the Classical Roman poet Virgil, and the pair then descend and travel through the underworld together. By convention, Dante himself is shown dressed in red robes with headgear, and Virgil with a laurel wreath on his head. 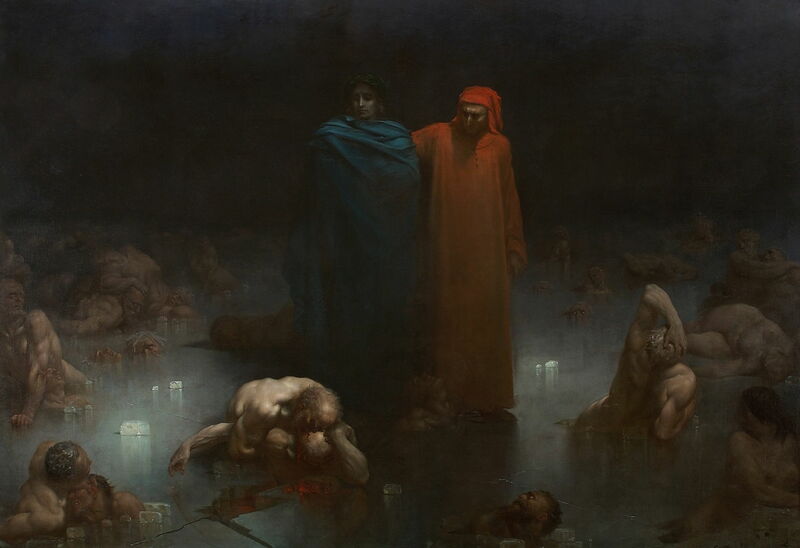 The sinners in hell are divided according to the type of sin; in this painting, Doré shows Virgil (left) and Dante at the last of these ‘circles’, the ninth, for those who committed sins of malice, such as treachery. These sinners are shown partially frozen into an icy lake, with additional blocks of ice scattered around, as described by Dante. Among the side-stories related by Dante is that of Paolo and Francesca da Rimini, who are in the second circle for the sins of lust. She committed adultery with her husband’s brother, Paolo Malatesta. Her husband Giovanni (or Gian Cotto) then killed them both. Doré shows the lovers, Francesca’s stab wound visible near the middle of her chest, Paolo’s still bleeding, as they are blown around and buffetted for their sins. At the lower right he shows Dante and Virgil looking on. 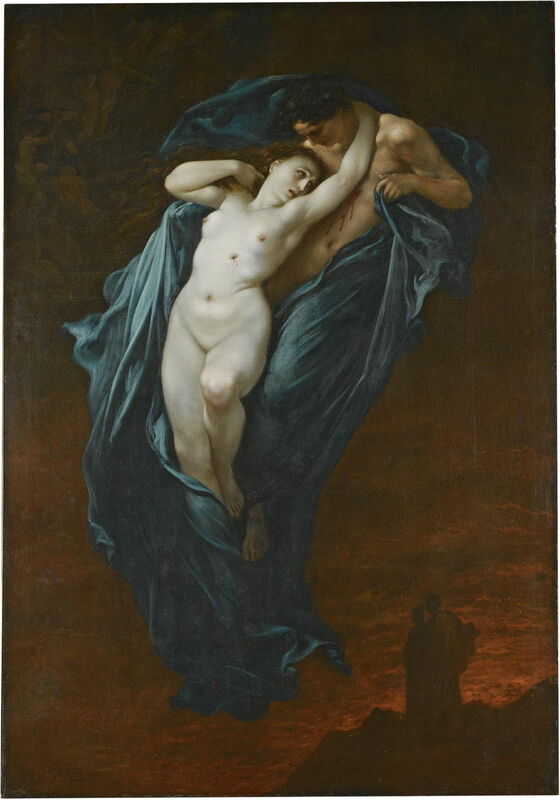 Doré’s painting was first shown at the Salon in 1863, and was highly praised by the critics. Gustave Doré (1832–1883), Between Sky and Earth (1862), oil on canvas, 61 x 51 cm, Musée des Beaux-Arts de Belfort, Belfort, France. Wikimedia Commons. Between Sky and Earth (1862) is a complete contrast and remains something of a mystery. 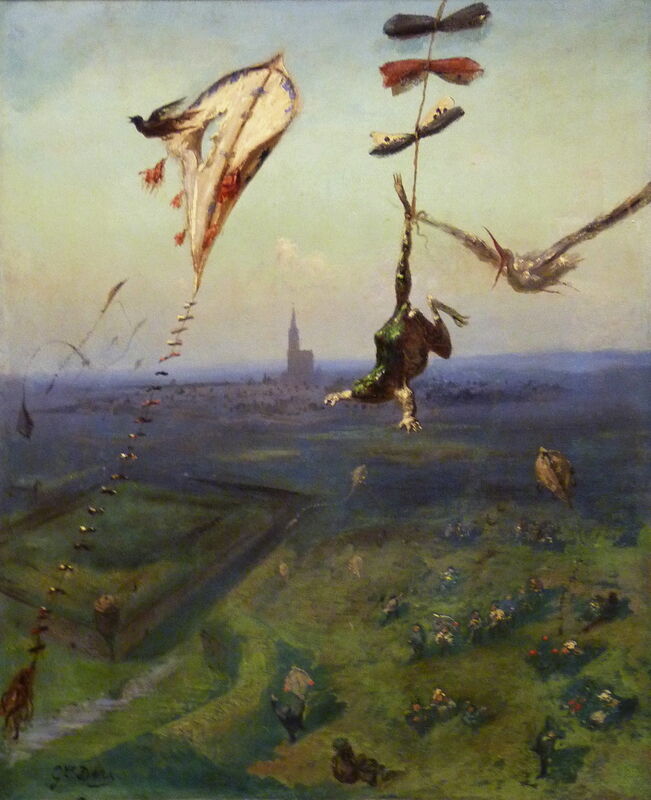 The viewer is high above the fields outside Doré’s native Strasbourg, where several small groups are flying kites. The kite shown at the upper left has just been penetrated by a flying bird. Another unseen kite, off the top of the canvas, has a traditional tail, at the end of which a very anxious frog is tied to it by a hindleg. However a stork appears to have designs on seizing the opportunity to eat the frog, and is approaching from behind, its bill wide open and ready for the meal. This could be an allegory, of course, but is probably a humorous depiction of kite-flying at the time, when people were still puzzled as to what happened to living creatures as they ascended higher in the atmosphere. Gustave Doré (1832–1883) The Triumph Of Christianity Over Paganism (c 1868), oil on canvas, 300 x 200 cm, Art Gallery of Hamilton, Ontario. Wikimedia Commons. By the late 1860s Doré was tackling more heavyweight narratives on very large canvases. The Triumph Of Christianity Over Paganism (c 1868) has become as elaborately symbolic as the paintings of the younger Gustave Moreau, who by this time was working on his The Muses Leave Apollo, their Father, in Order to go Forth and Enlighten the World (c 1868). 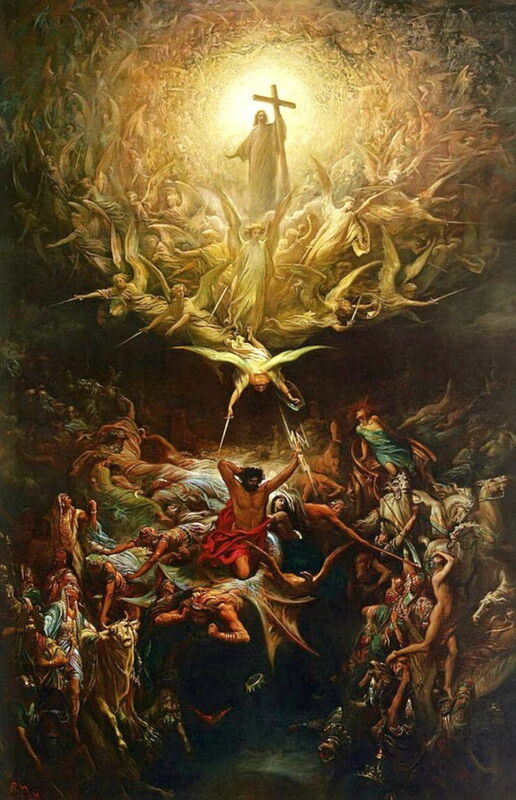 In the upper part of this painting, Christ, bearing his cross, is surrounded by the angelic host, which is flying out, swords drawn and shields borne, to fight the pagan evils on the earth below. Among those pagans are recognisable gods of the Classic world, with Zeus/Jupiter at the centre, holding a thunderbolt in his left hand. At the time of the Franco-Prussian War in 1870, Doré volunteered to serve in the National Guard, and produced a series of moving sketches showing the destruction and suffering in Paris at the time of its siege in the autumn of that year. The following year he committed some of those apocalyptic visions to canvas, in his The Enigma (souvenirs de 1870), and two other major paintings. All three were made using grisaille, greys normally used to model tones in traditional layered technique. 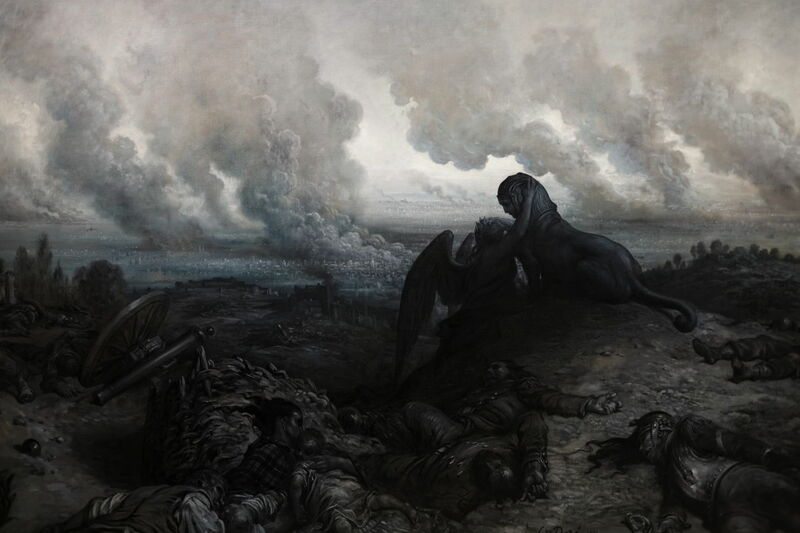 This shows the shattered and still-burning remains of the city in the background, bodies of some of the Prussian artillery in the foreground, and two mythical beasts silhouetted in an embrace. The winged creature is female, and probably represents France, who clasps the head of a sphinx, who personifies the forces which determine victory or defeat. The enigmatic question would then relate to the Franco-Prussian War, and the reasons for France’s defeat. 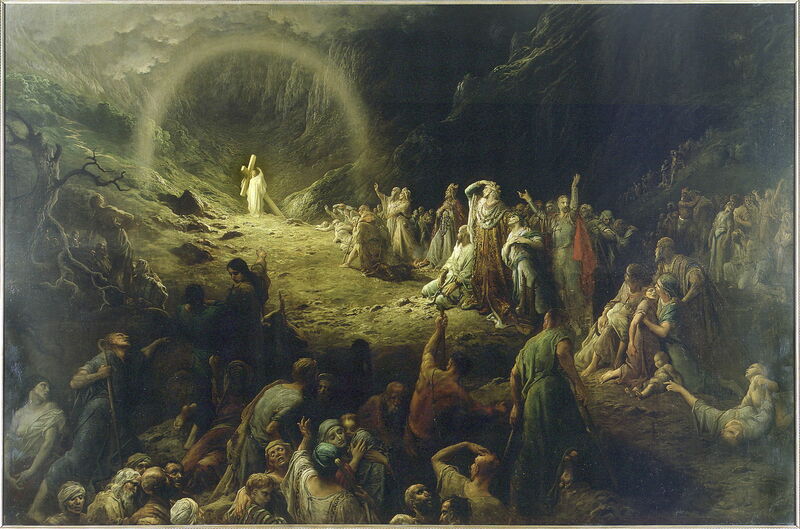 Doré continued to paint religious narrative works, in particular several versions of Christ’s Entry into Jerusalem. This, a preparatory sketch for the final huge version exhibited at the Salon in 1876, shows his brushwork at its loosest and most gestural. This shows the conventional Christian account in the Gospels, of Christ entering Jerusalem, in triumph, on the back of a donkey, as the start (‘Palm Sunday’ because of the palm fronds usually involved) of the series of processes leading to his crucifixion. A very popular biblical narrative in European painting, few finished works can match Doré’s at 6 by 10 metres size. At the time of his death in 1883, Doré was close to completing another only slightly smaller painting showing The Vale of Tears. Drawn not from the Gospels but instead from Psalm 83, reinforced in the writings of Saints Jerome and Boniface, and in the mediaeval hymn Salve Regina (‘Hail Holy Queen’), it refers to the tribulations of worldly life which are left behind when the pious enter heaven. It is also sometimes known as the Valley of Tears. Christ, now bearing a full-sized cross, is in the distance, surrounded by an arch of light. He is beckoning a large crowd of people, who are struggling up a steep and rough track leading towards him, and the rocky mountains behind. People in the crowd are of all ages, from infants to the aged, many with obvious physical disorders and ailments, all apparently suffering in their ascent up the Vale of Tears. I wonder whether Doré knew that his journey was also coming to a close. As with Hogarth earlier, and Doré’s contemporary William Frith – and perhaps the earliest painter and prolific print-maker, Albrecht Dürer (1471-1528) – most of Doré’s paintings were turned into successful prints. Like Hogarth and Frith (but unlike Dürer, who painted few narrative works), Doré was a fluent teller of stories in paintings. He appears to have used fairly conventional techniques to do so, but without better access to a wider range of his works it is hard to be more definite than that. It is high time for a thorough account of Doré’s paintings. Musée d’Orsay biography and works. There does not appear to be a book in print which gives a good account of Doré’s paintings. If you discover one which is available on the secondhand market for a reasonable price, please let me know. Posted in General, Painting and tagged Dürer, Doré, Frith, Hogarth, narrative, painting, prints. Bookmark the permalink. H e l l . . . .
Beautiful scenes from Gustave Doré imagination and faith.